648 pages | 39 Color Illus. | 52 B/W Illus. 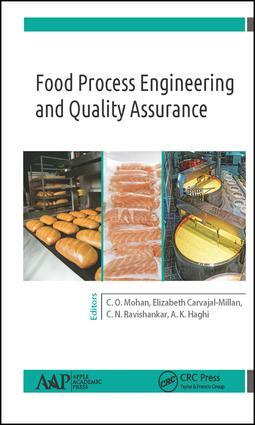 This new book, Food Process Engineering and Quality Assurance, provides an abundance of valuable new research and studies in novel technologies used in food processing and quality assurance issues of food. The 750-page book gives a detailed technical and scientific background of various food processing technologies that are relevant to the industry. The food process related application of engineering technology involves interdisciplinary teamwork, which, in addition to the expertise of interdisciplinary engineers, draws on that of food technologists, microbiologists, chemists, mechanical engineers, biochemists, geneticists, and others. The processes and methods described in the book are applicable to many areas of the food industry, including drying, milling, extrusion, refrigeration, heat and mass transfer, membrane-based separation, concentration, centrifugation, fluid flow and blending, powder and bulk-solids mixing, pneumatic conveying, and process modeling, monitoring, and control. Food process engineering know-how can be credited with improving the conversion of raw foodstuffs into safe consumer products of the highest possible quality. This book looks at advanced materials and techniques used for, among other things, chemical and heat sterilization, advanced packaging, and monitoring and control, which are essential to the highly automated facilities for the high-throughput production of safe food products. With contributions from prominent scientists from around the world, this volume provides an abundance of valuable new research and studies on novel technologies used in food processing and quality assurance issues. It gives a detailed technical and scientific background of various food processing technologies that are relevant to the industry. Special emphasis is given to the processing of fish, candelilla, dairy, and bakery products. Rapid detection of pathogens and toxins and application of nanotechnology in ensuring food safety are also emphasized. Morphoanatomic, Taxonomic and Physiological Aspects of Euphorbia antisyphilitica Zucc. C. O. Mohan, PhD, is currently a Scientist at the Fish Processing Division of the Central Institute of Fisheries Technology (Indian Council of Agricultural Research), in Willingdon Island, Kochi, Kerala, India. Dr. Mohan is from the historic place of Chitradurga of Karnataka, India. He graduated in fisheries sciences from the College of Fisheries, Mangalore, Karnataka. During his master’s and PhD studies he specialized in fish processing technology at the ICAR-Central Institute of Fisheries Education, Deemed University, Mumbai, India. His areas of interest are thermal processing and active and intelligent packaging. He has an h-index of 8.0. He has been awarded the Jawaharlal Nehru Award for his doctoral thesis research from the Indian Council of Agricultural Research, New Delhi. He has guided many postdoctoral students and has published in many reputed national and international journals. Elizabeth Carvajal-Millan, PhD, is a Research Scientist at the Research Center for Food and Development (CIAD) in Hermosillo, Mexico, since 2005. She obtained her PhD in France at Ecole Nationale Supérieure Agronomique à Montpellier (ENSAM), her MSc degree at CIAD, and undergraduate degree at the University of Sonora, in Mexico. Her research interests are focused on biopolymers, mainly in the extraction and characterization of high value added polysaccharides from co-products recovered from the food industry and agriculture, especially ferulated arabinoxylans. In particular, Dr. Carvajal-Millan studies covalent arabinoxylans gels as functional systems for the food and pharmaceutical industries. Globally, Dr. Carvajal-Millan is a pioneer in in vitro and in vivo studies on covalent arabinoxylans gels as carriers for oral insulin focused on the treatment of diabetes type 1. She has published 57 refereed papers, 23 chapters in books, over 80 conference presentations, one registered patent, and two more submitted. C. N. Ravishankar, PhD is at present the Director of the ICAR-Central Institute of Fisheries Technology (CIFT) in Cochin, India. He completed his graduate studies in fisheries sciences and specialized in fish processing technology during his master’s and PhD degrees from the College of Fisheries, Mangalore, Karnataka, India. He is an expert in the field of fish processing and packaging, and he developed, popularized, and transferred many technologies to the seafood industry. He participated in the First Indian Antarctic Expedition and traveled widely abroad for training and consultancy programs. He has more than 200 international and national publications to his credit, and he has an h-index of 15.0 and has filed 17 patents. He received the Outstanding Team Research award in the field of fish products technology from the Indian Council of Agricultural Research, New Delhi, and the K. Chidambaram Memorial Award from the Fisheries Technocrats Forum as well as a Gold Medal for his PhD work, a Merit Certificate from the Royal Institute of Public Health & Hygiene, London. He was instrumental in establishing the Business Incubation Centre with office and pilot plant facilities for the entrepreneurship development in fish and other food products. In addition to his many other activities, he has delivered numerous invited talks on fish preservation techniques, food packaging, business incubation, and other related areas.